COULD YOU HELP SOMEONE LIKE PHILIP? Earlier this year, while playing his regular Tuesday night tennis, Philip Gengos felt a sudden tear in his back followed by the immediate onset of dizziness and nausea. He felt unwell and was persuaded by his friends to go straight away to hospital emergency. The hospital Philip attended happened to be Royal Prince Alfred. Hospital staff decided to keep him overnight and next day could still not find any issue. Philip’s condition was possibly due to a congenital aortic defect which it is estimated may affect 1 in 1000 men and women. Familial thoracic aortic aneurysm and dissection (TAAD) is a disorder that involves problems with the aorta, which is the large blood vessel that distributes blood from the heart to the rest of the body. Familial TAAD affects the upper part of the aorta, near the heart. This part of the aorta is called the thoracic aorta because it is located in the chest (thorax). In familial TAAD, the aorta can become weakened and stretched (aortic dilatation), causing a bulge in the blood vessel wall (an aneurysm). Stretching of the aorta may also lead to a sudden tearing of the layers in the aorta wall (aortic dissection), allowing blood to flow abnormally between the layers. Dr Michael Wilson performed the surgery and later said that Philip’s aorta had torn quite a lot and that it was one of the most difficult operations of its type he had performed. At 53, Philip had no previous illnesses or medical problems and as a result never thought to have a check-up. He had not experienced any warning signs other than feeling and looking tired. All of this he had put down to his age and just working hard. When asked initially, about whether there was any history of heart problems he could not remember. At the time he was asked, he had forgotten that his grandfather died suddenly in his early 50’s. Philip did not know what his grandfather had died of but presumed that it may have been due to problems with his mitral valve – something that Philip’s father had suffered with late in his life. 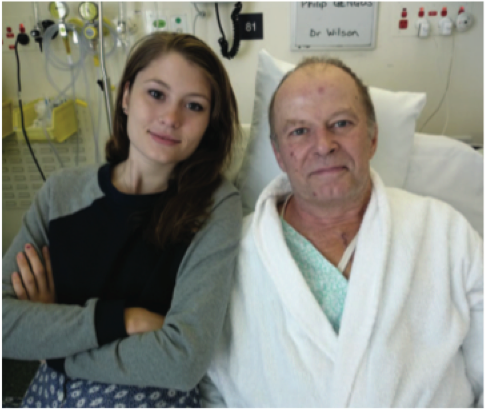 Whether Philip’s torn aorta was due to a congenital condition or not, he will now need to commence the regular surveillance management program which is in place at Royal Prince Alfred Hospital. It will be important for all members of Philip’s family bloodline, who might potentially be at risk, to be checked. TAAD is rapidly becoming one of the most common but silent killers in western society. The all too common story is that diagnosis is incidental to the symptoms from damage done. The Baird Institute’s research is aimed at determining the precise genetic basis of Thoracic Aortic Aneurysm Disease, the mechanisms leading to the changes in the aorta, and developing peripheral tests to detect enlargement of the aorta and imminent rupture. Our goal is to determine when surgical intervention is optimal or at the lowest risk time for the patient. The Baird Institute’s Aortic Disease Group is led by Professor Paul Bannon and Associate Professor Michael Vallely and includes one of our current PhD students, Dr Andrew Sherrah.